Kivier stared through the window at the newly green meadow lying before him. "It's Easter," he sighed contentedly, watching the last bit of snow dissolve under the hot sun. As much as he enjoyed the warm weather that wasn't what exciting him, he was anxious to see what the Easter activity would be. Last year his older Darigan Zafara sister Qenia had brought him and his siblings out to a large grass meadow in the heart of Meridell. There they had hunted around, searching for the tiny chocolate eggs that the "Easter Cybunny" had left. He knew it wasn't a Cybunny; Qenia always snuck out early on Easter morning to lay down the chocolate though she maintained that it was a mythical being's doing. It didn't bother him, though; he liked the whimsy of it all. The Baby Hissi examined his wings that hung next to his sides and sighed. As much as he liked being a baby, he didn't understand why he retained the mindset of a baby. In a lot of ways he wished he could be more grown up, stronger and more clever. Like SBad and Hettui. His Halloween Gelert and Royal Shoyru brothers were well-read and brave. In a lot of ways, Kivier emulated them and wished he could find the strength inside of himself that would help him grow up. Today, though, it was all about staying young. Kivier couldn't wait to run around and enjoy life. It was a crisp spring morning outside of their Meridell residence. The air was slightly chilly and the grass was a brilliant green. The sun shone down from its place in the sky, but even this did little to offset the bitter wind. Kivier bundled himself up in a woolen hat and scarf before waiting by the door. When Qenia didn't immediately come down, he began to get curious. "Could the surprise be upstairs?" he wondered. Finally, after what seemed like an hour of waiting, Qenia emerged from her room at the top of the stairs and slowly descended. She yawned loudly as she did so and still had sleep hanging in the corners of her eyes. "When are we going?" Kivier asked impatiently. "When are we going where?" Qenia inquired, her voice sounding somewhat distant. She yawned again. "It's... It's Easter," Kivier spluttered. "We always do something for Easter!" "I know," Qenia responded with a smile. "But I thought we could do something different this year..."
"Well, Kiv, you don't realize this, but you are quite privileged in this world of Neopia. You have the clothes you need and your own room and a family who loves you. It occurred to me last night as I was drifting off to sleep that maybe you don't appreciate it as much as you should. 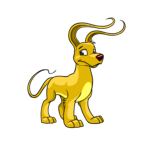 So today isn't going to be about you and your brothers; we are going to make it about the neopets who aren't as fortunate. 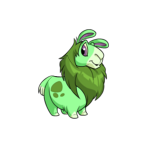 I thought that we could go down to Neopia Central and plan something for the neopets in the Pound. They aren't able to have much fun, you know..."
"I'm not going!" Kivier interrupted as he stomped his foot in irritation. "I want chocolate! I want fun! Why are you so mean?" He began to feel hot tears run down his face and he raced up to his room. Slamming the door behind him he felt his sadness dissipate and turn into anger. "I won't do it," he muttered under his breath. "I'll show her. She can't take away my day." At the base of the stairs, Qenia shook her head in sadness. Then she felt a comforting paw on her shoulder. "Don't worry," Hettui's calm voice said. "He'll come around. I personally think it's a great idea. Much better than any chocolate or presents." Qenia nodded. "I just hope I made the right decision," she said. "I think his reaction shows that you did," Hettui replied with a smile. An hour went by as Kivier lay on his bed in his room. The light blue sheets smelled fresh and the sight of them usually calmed him down. Not today, though. He could feel the blood coursing in his veins. He didn't think he had ever been this angry. It had been a mistake to get his hopes up. He felt like he had to get out of the house. Gingerly making his way down the creaking wood stairs, he arrived at the front door. Being careful not to make a sound, he opened it and stepped outside. The sun was so bright that it temporarily blinded him and he staggered forward. As his eyes adjusted to the light he let out a sigh. Now he could do what he wanted to do! He started marching towards the bustling downtown of Meridell. Inside his pocket he had his weekly allowance of 50 NP and he knew he could get a few cookies and pieces of chocolate with it. He didn't need his family! He could have his own fun. He arrived at Meridell Foods and walked inside, his head held high. The place was bustling with people and he began to scour the shelves for delicate goodies. Behind him, he suddenly heard a musical voice. It was so light and beautiful that he immediately began to concentrate on it. "Mom, do you think we could buy a lollipop? They are relatively cheap," the Blue Usul's voice trilled. Kivier turned around and stared at her, transfixed. He watched aptly as the girl's mother pulled out a change purse from her pocket and counted out the neopoints that lay within. "I'm so sorry," the mother said, her voice as heavy as her daughter's was light. "I know it's Easter, but I can only afford the necessities that we came here to buy." Kivier watched as the girl's face visibly changed. It fell slightly and when she spoke next her voice had lost some of the magic that it had contained before. "No, don't worry about it, Mom," the girl responded. "I was just wondering is all. I thought that maybe my brother would like some, but that's alright. I don't actually want any myself. Besides," she continued, picking a Pootato off the shelves, "I like the things you buy just as much as any candy." The mother smiled sadly and took the girl's hand. Together they paid and left the shop. Kivier watched them leave, feeling something heavy in his stomach. Without thinking, he ran up to the counter and bought two lollipops and then dashed out into the street. Out of the corner of his eye, he saw a piece of familiar brown clothing heading east, and he ran after it, hoping to catch up. The girl and her mother turned down a side street and Kivier kept running, feeling his chest grow tight. "Wait one moment," he gasped once they were within earshot. The girl and her mother turned around and stared at the little Hissi running up to them. "Here," he said as he thrust the lollipops into the girls hands. "I thought you might like these." "What?" she asked, her face wrinkling in confusion. "I don't know," Kivier responded, "because it's Easter, I guess. Everyone should have candy." He felt his face flush with embarrassment as he heard how lame that sounded. To his surprise, the girl leaned down and kissed his purple baby cheek. "Thanks. You made my day," the Blue Usul said and pulled off the wrapper. She smiled as her tongue tasted the sweetness of the bright red candy. "No problem," Kivier answered. "But I should go." He turned around and began walking home. He was out of neopoints and his stomach growled, but he really didn't care. He felt better than he had in days. As he walked up to his neohome, he saw Qenia standing in the doorway. "Where have you been?" she shouted upon seeing Kivier. "I've been so worried!" "I've been learning about life," Kivier said, smiling. "I'm ready to go to Neopia Central now. It feels like the right thing to do." Qenia smiled proudly at the Baby Hissi. "Hey now," she chuckled. "Just because we are going to do a good deed doesn't mean we can't celebrate Easter. Go into the living room; Sbad and Hettui are waiting." Kivier felt himself smile and rushed into the living room. His eyes lit up as he saw the wrappers glinting. They were still doing an egg hunt! He laughed and began to run around, picking up all the eggs that he could find. Sbad and Hettui joined in until all the eggs were collected. Their baskets overflowed with chocolate candy. "Want to divide it up now?" Qenia asked. "Sure," Kivier said. "But put half of mine in a separate pile." "Why?" Qenia looked at him curiously. Kivier shrugged. 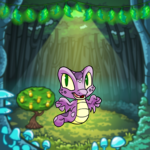 "Maybe the neopets at the pound would like it. They don't get candy otherwise." Qenia didn't know what had happened to change the Hissi's mind but impulsively she rushed over and hugged him. "You truly are growing up," she whispered. Kivier smiled quietly into her shoulder. The Top 10 countdown to where you should hide your neggs from the Easter Cybunny himself.